Hot damn for Hot Italian! There’s a booming world of Vegan food going down in the East Bay (Oakland, Emeryville, Berkeley) and I love it. What I don’t love is how the City Of San Francisco is falling so far behind in this food explosion of plant based cuisine. Perhaps I’m being selfish because I just can’t drive down the street to get a good Vegan pizza that is to the quality standard of Hot Italian. Hot Italian isn’t even a 100% Vegan establishment! It’s just a great pizza spot, with an open space concept, that understands how to cater to all types of diets. It also helps that they are in the heart of all the Vegan food that is Berkeley, CA. They serve Daiya cheese – Normally, pizza spots just don’t have this down. 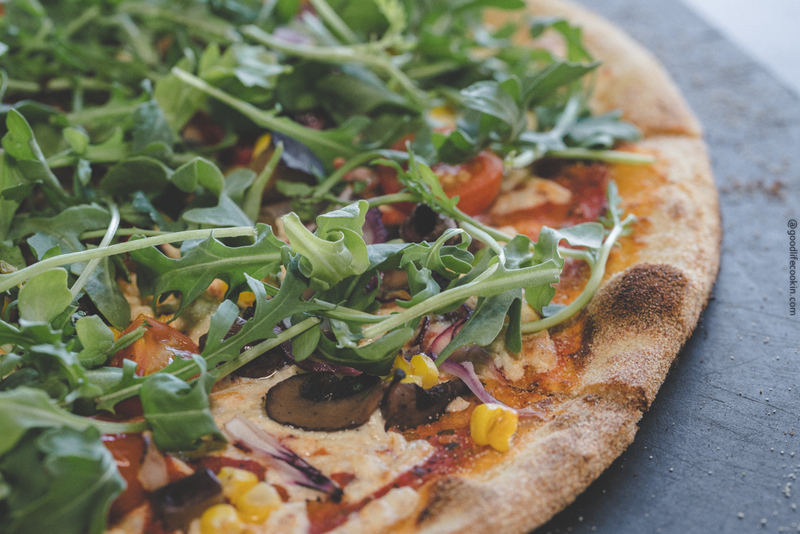 They use fresh ingredients – On their Vegan pizza they will use fresh seasonal ingredients like pumpkin squash, olives, arugula..etc. They make a thin pizza crust – I’m a sucker for thin pizza crust. I just love how a thin crust has so much more bite and crunch to it. But just when you think it couldn’t get better, that’s where Hot Italian serves you up. See, there’s always something special that a chef puts into their recipes. At Hot Italian, that special love is their olive oil! Yes, Olive Oil. They have a rosemary and piccante flavored oil that’s so delicious you’ll just want to drink it. I literally pour this oil all over my pizza and do I feel guilty in doing so? Hell no. It’s so good! Just pull up a slice with a little bit of a fold, and pour this oil down like it’s flowing through a river draining into the Black Sea that is your mouth. They have some really great ciders and beers on tap but we washed everything down with an iced tea and called it a day! I have a dream that one day, every restaurant in the Bay Area will offer a Vegan option/menu. That day may never come, but until then, I’ll be frequenting my favorite spots that are ahead of the times and support them every way I can. Check out Hot Italian next time you’re in the Bay Area!